So all those rumour of Bigg Boss being fixed have come true. 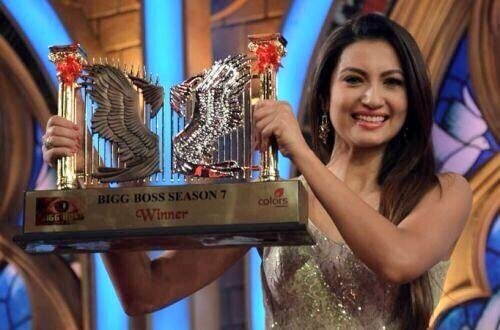 Miss cry, Drama Queen and most annoying contestant of BB7 is declared winner. Very sad and disappointed. She will be walking away with the whopping prize money of Rs.fifty lakh and the beautiful trophy. Like the previous seasons, even the current season of the show became a talk of the town with its share of fights, romances and controversies. It also saw two contestants Sangram and Kamya Punjabi break a record by sitting in a ‘Bigg Box’ for 26 hours. They all survived a stay of 105 days (except Gauhar, she went out for 2 days) in the BB house without any contact with the outside world and under the prying eyes of over 84 cameras. Sangram Singh was the 1st to walk out from four and then Ajaz Khan. Two ladies of the BB7 house Tanisha and Gauhar were on the stage with Salman. Rumours are that Kushal Tandon has left not a single stone unturned in making all his friends and family to vote for Gauhar. He has set up a team of 15 odd persons spearheaded by his father and friends who are not only sending SMSes requesting to vote for Gauhar but are also casting votes from enumerable SIM cards purchased to raise the vote counts. If all this is true, than Kushal will definitely ask for his and his father’s share in the prize money. After all it’s their hard work that had made Gauhar Khan win the show. Otherwise how can she be the winner, when she was also out of the show for 2 days? She was the most hated contestant of this season. Such arrogant and full of Me Me, how can she be the winner? All that love drama, love triangle and “I want to grow old with you” paid off! This means only people who are bad, rude and arrogant can win the show, what’s the point of being human in the show? I think next season Bigg Boss 8 will be not have any male contestants in the house, as from last so many seasons it’s only ladies of BB house who are winning!